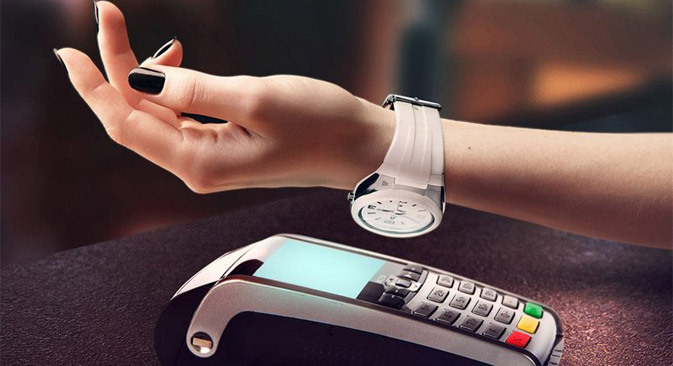 Russian banks have started distributing a watch that allows consumers to pay for purchases in one touch. Since the vast majority of the Russian population still prefers cash to make purchases, this new service must overcome certain cultural and psychological barriers in order to expand. Russian banks now offer customers a new way to pay for purchases. In mid-July, Alfa Bank started selling Austrian Watch2pay watches, and it was soon followed by Center-Invest, based in Rostov-on-Don. Gazprombank and AK Bars in Kazan, however, introduced the gadget even earlier, in April 2013. The watch has a built-in bank card with MasterCard PayPass support for contactless payment. Currently, the watches can only be used at 1,564 shops in Moscow, 610 in Kazan, a little over 100 in St. Petersburg, and only a few dozen in other major cities. These are primarily supermarkets and fast food restaurants, such as McDonald’s and Subway. You can also pay the fare on some bus routes in Moscow and St. Petersburg. According to the National Agency for Financial Studies (NAFI), however, more than half of Russia's population has never used non-cash means of payments, and 90 percent rely on cash for basic daily purchases. Is there a future for PayPass? The head of NAFI’s press office, Olga Lvovskaya, believes gadgets that support MasterCard PayPass could find their market primarily in the Russian Far East. According to NAFI’s data, Internet banking is used by 18 percent of the general Russian population, but that figure reaches 30 percent in the Far Eastern Federal District. Lvovskaya said residents there are more tech savvy due to their proximity to Asia. According to analysts, contactless payment systems need several more years to become popular in Russia. Most likely they will be integrated with smartphones, while other gadgets won’t be able to enjoy the same success, Arnautov believes. “Voice recognition, fingerprints, the eye retina and other biometrical data will be used for contactless payments in the future,” said Arnautov.